South Mumbai has a new landmark near the colonial era Opera House. It is a solar powered automated teller machine (atm), installed by the IndusInd Bank in its four-storey building at Lamington Road. It was inaugurated on December 18. The solar panels spread atop the roof of the building have photovoltaic cells that capture and store solar energy. 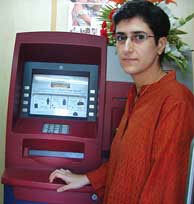 “Solar power runs the atm eight hours a day during the peak usage time (2pm-10 pm). In case of power failure too, the system shifts to solar mode,” said Rashneh Pardiwala, director of the non-profit, Centre for Environmental Research and Education that was commissioned to install the system. Managing director of the bank, Ramesh Sobti, said at least a 100 out of the 500 atms, managed by the bank, will switch to solar power by the end of 2010. He said the cost of installing a solar powered atm is higher (Rs 7 lakh as against Rs 5 lakh for a standard atm) but the extra cost is recovered in four-and-a-half years by way of savings in the electricity bill. Replacing conventional energy with eight hours solar energy will save the bank Rs 20,100 annually, said Sobti. In places where atms are powered by diesel generators, money saved annually by switching to solar power would be higher—Rs 40,200. The atm is supported by two solar panels. The panels have a built-in controller which feeds the system and charges the batteries simultaneously. A meter behind the atm measures the solar power consumed. A microprocessor helps to switch from one power mode to another. So even if there is a power failure, customers can use the atm, said Sachin Rele, chief executive officer of Autonic Energy Systems that supplied the solar panels for the project and helped with technical specifications.